The last day of BUCS was another eventful day for USBC. 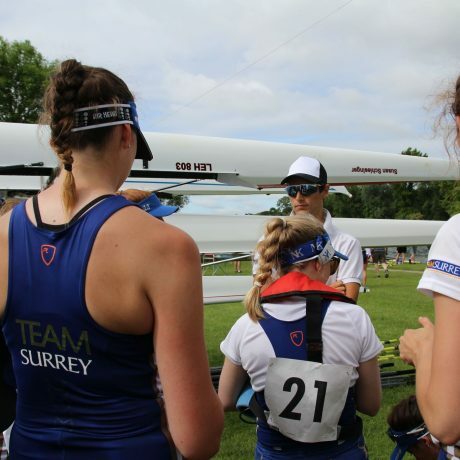 As the beginner squad had finished their races on the previous day, they were all there to help the racing crews by assisting with carrying blades and getting boat numbers. Furthermore, they started to derig the boats that were no longer needed in order to start loading the trailer for the journey home in the evening. In the morning the women’s intermediate coxed four were the firsts to time trial. Coxed by Lizzie MacCann the crew was looking forward to the race. After an extended warm- up, Ellie Stevens, Maddie Gardner, Megan Pearson and Anika Piezka went on to push through the time trials. After coming out of the quick boats, i.e. the quads and the eight, the boat felt heavy for the crew. They pushed on and went into the D-final which is not where they hoped to be, after the good results of the previous days. 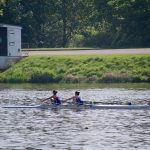 Thereafter, the men’s championship pair, consisting of Ali Douglass and HPASS scholar George Stewart, went on for their time trial. 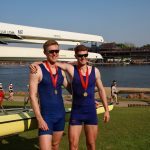 Last year, George won a silver medal in the U23 World Championships in the coxed four while Ali won a bronze in the men’s eight. Both of them have a lot of racing experience together as they basically lived in the pair during the last year and competed in it at GB trials. Therefore, the two knew how to tackle the time trial. They finished the time trial in first place, which, as it was a championship event, meant that they would go straight to the A final. This was all according to plan, because the crew now had a long break where they could retreat and get hyped up for the final. In the next time trial, two intermediate women’s doubles raced. They were drawn to be only 2 boats apart from each other, which meant that the second double was chasing down the A crew. The first double consisted of Megan Moloney and Naomi Coleman. The crew had a strong race accompanied by the shouts of the rest of the squad. The second double consisted of the Lizzie MacCann and Jasmine Bone. As a lightweight crew they were looking to challenge the other, heavier crew. As a result of their efforts the B double reached the D- finals and the A double went into the F-finals. 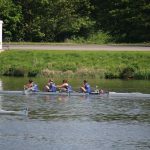 The last Surrey crew to time trial was the men’s intermediate quad consisting of Giovanni Morescalchi, George Glenister, Ben Radcliffe-Brown and Kieran Dibley. 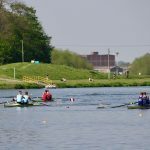 After finding together as a crew during a weekend at Dorney Lake, they were buzzing for the race. Out of the time trial they went into the D-finals. After a lunch break, all of the crews got ready for their finals. 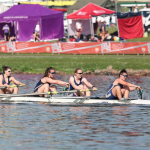 The four took on the advice given by coaches Sam Tuck and Iona Riley into their D-final. They had a good row up to the start line. They gave it their all in the race, but due to a big weekend for all of them, they only finished in third place, ranking them 21st in the country. They were disappointed with the result but quickly realised they still have a lot to learn about racing strategy and are looking towards improving based on their experience. The girls competing in the doubles, had a good rest and were excited to race again as all but Jasmine hadn’t competed in a double. Due to start practice and several 2km pieces on the Molesey stretch, they felt ready and determined to take on this opportunity. 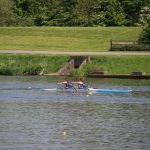 The WInt2x (A) competed in their F-final and placed overall 34th. Not much later, the B double went down the course to finish 22nd in the country. Both crews are happy with their performances as they had no idea of how they would stand on a country wide field. Then, the men’s intermediate quad went out with determination. Coming out of the time trial as the fastest crew in their D-final, they were aiming to win their final. 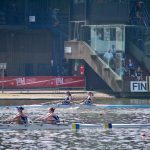 As such, they stayed among the leading crews until they started making a big push in the last 500m through which they secured a win in the final. They placed 19th in the country and were pleased with their performance. Last but not least, the men’s champ pair returned from their extended break. Straight onto the warm-up, the coaching team made sure they were ready for their big race. Despite Ali Douglass not rowing competitively this year due to his work as VP Activity at the University of Surrey Students Union, he was very capable of showing his peak performance due to an individually tailored training program by head coach Sam Tuck. As such the other competing crews were left to spectate exactly how fit Ali still was and they were up for a surprise. Lined up against other top universities, like Durham, Oxford Brookes, UL and Edinburgh the pair started on lane 1, closest to the bank and furthest from the coaches. George was competing against his new pair’s partner who was sat in the Edinburgh boat, giving him extra motivation to beat him. After the first 500m all the boats were still very close together but the pair came off the start in last place only .8 seconds behind the crew in front. Coming up to the 1000m marker the field started to thin out, with Surrey in second place, about one length behind the Edinburgh crew. As planned, the boys started their move early. They started creeping up on the crew in front and 1500m in there was only a canvas between them. That is when they shifted up a gear as they started hearing the cheers of everybody in the squad on the bank. They put down an amazing final sprint and eventually finished in first place with a 4 second lead. This was the first BUCS championship gold for both crew members and they – as well as the rest of the squad – were so excited and happy. Everybody was there to support them when they collected their medals and came off the water. This was the highest of highlights of the day and the weekend. They ended the BUCS campaign with a high for the whole club. All in all, BUCS regatta has been a great experience for the whole club. 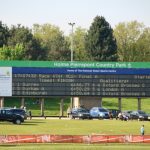 Results are showing the progress of the squad and leave us all excited to come back in the next year and improve our placings. Furthermore, we can’t wait for the upcoming regattas this summer!